Yesterday – Jan 20th, 2012- it happened to be one of the major Hindus’ Festivals: Maha Shivaratri… as reported in one of its many different spellings. I attended it in Mysore (Karnataka, South of India) together with tons of Indians extremely exited by it. What? During the night of Shivaratri, every Shiva’s devotee is supposed to stay fully awake, to visit the temple and do puja to the Shiva Linga (a fallic representation of the god). 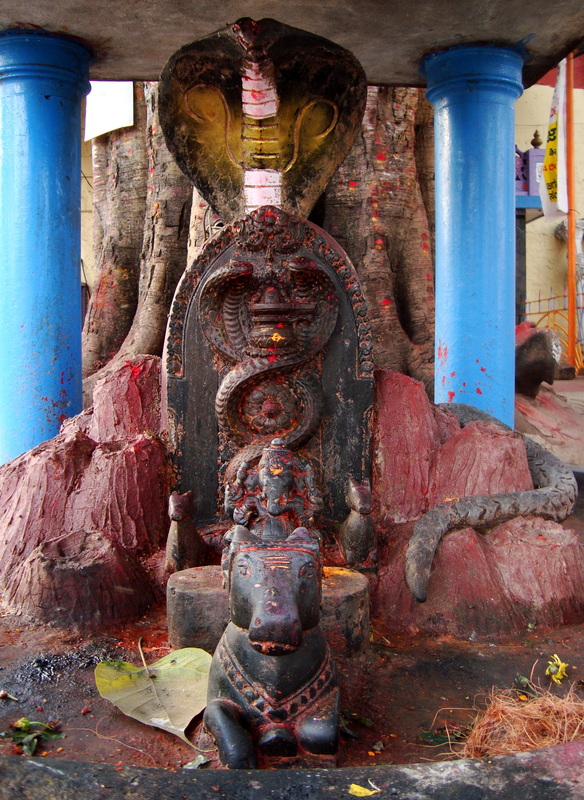 The puja consists of an offering that can go from flowers to Bilva leaves (Shiva’s favourite tree) and includes bathing the Linga with water, milk, ghee, honey, etc…The ritual also includes fasting on the same day. There was once a thief that, on the 13th evening of Maagha month, robbed a Linga in a Shiva temple. To escape being caught, he ran to the forest. But while he was wondering in the forest, he encountered a tiger and being extremely scared quickly climbed a tree. In doing so he had to let go the Linga that consequently fell on the ground just below the tree. The thief was there, clenched on a branch waiting for the tiger to leave but no way, the tiger was laying there as if waiting for him to fall and have it own dinner. In the meantime the night fell and the thief started to be extremely worried at the idea that he could fall asleep and as a consequence fall from the tree branch. At this point he heard that at the Shiva temple in the far distance some chanting was going on, so he had an idea: ‘if I chant after them – the thief told to himself – that will help me stay awake’. So he started chanting to Shiva. Nonetheless the night was long and a few times he couldn’t resist getting asleep, but each time he was able to grab some branch and stay up there. In doing so, he didn’t realize that he was shaking the tree that was a Bilva tree – dear to Shiva – and as a consequence leaves where falling down just above the Linga. So all night long went on like that with the thief unconsciously worshiping Lord Shiva. And of course, as a consequence of all this worshiping on such a propitious time, the thief got enlightened by the morning. What’s the meaning of the story? being fully awake – as synonymous of being fully aware – on such a propitious time, great things can be achieved. So last night as recommended to us by Sharath – my Ashtanga Yoga Teacher – I didn’t miss the opportunity to go to a few Shiva temples and enjoy being caught in such a hectic activity and night… AMAZING is the word! So what to do in Mysore on such a night? 3/ than to the Shiva temple in Gokulam, the one just near the Loyal World in 2nd stage. This one was recommended by Sharath, but he was right when he said the queue could be up to 2 hours… actually it went all round the block. (Irene and myself than we decided it was already too late, so we went to a sideway small temple dedicated to Ganesh and did our own puja there, just to discover that very near there was a biiiiiiiiig Bilva tree where many small Lingas and a beautiful sculpture from the Kashmiri Shivaism including a sort of Linga with a representation of Ida, Pingala and Sushumna all protected by a huge cobra was standing there. We were so happy to see it that we didn’t miss the fact we couldn’t enter the main temple). This entry was posted in India, Travelling Around. Bookmark the permalink.